How Does Eating a Lot of Corn Affect Cows? In nature, cows don't eat corn. They subsist on grasses and similar forage. That's how their digestive systems are designed to operate. Farmers and ranchers might feed a lot of corn to cows in order to have them gain weight quickly, or because corn happens to be cheaper than hay at a particular time. Proper nutrition is something to consider when you're deciding whether to pay more for grass-fed beef. Most beef cattle spend the last three months of their lives in feedlots, eating corn to reach a specified weight before slaughter. If you eat beef, you're almost certainly consuming corn-fed beef unless the packaging or restaurant specifies that the meat comes from grass-fed animals. Not only do cattle fed corn gain weight faster, but their meat contains more marbling, or fat, along with a more consistent taste. In contrast, meat from grass-fed beef contains fewer calories and far less fat. Cattle are ruminants, animals with four-part stomachs. Unlike those with one-part stomachs -- such as dogs, cats and people -- cows bring their food back up after swallowing for rumination, or cud chewing. Over half the protein in corn is "escape" protein, according to the North Dakota State University website. That means it's a type of protein not fermented by microorganisms in the cow's rumen, the largest part of the stomach. Instead, the cow's small intestine digests and absorbs escape protein. The rest of the protein in corn is degraded in the rumen. Microorganisms in the rumen require that type of protein in order to serve their digestive function. Because it's not natural for cows to eat large quantities of corn, animals raised on it are more likely to suffer from health issues. The most common include bloat, or possibly fatal amounts of excess gas, and liver abscesses. The more hay or grass a cow eats compared to corn, soy and other grains, the less likely the animal will develop these digestive problems. Cows consuming a lot of corn are more susceptible to E. coli infection, which can in turn infect people who eat the meat. Corn is high in phosphorous and low in calcium, a recipe for the development of urinary stones in cattle. Because corn-fed cattle are so likely to suffer from stones, even in their relatively short lifetimes before slaughter, they require calcium supplementation. 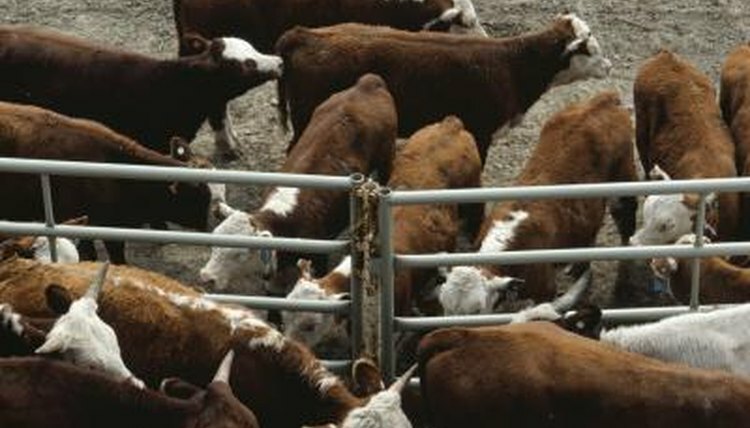 The NSDU website recommends a calcium-to-phosphorus ratio for feedlot diets of a minimum of 2-to-1, or two parts calcium to one part phosphorus. Adding limestone to the feed usually achieves the correct balance. What Are the Sticky Things Under a Cow's Tongue? What Do Farmers Feed Cows? What Kind of Animals Eat Soybeans? What Horse Feed Gives the Most Energy? What Kind of Oats Should I Feed My Horse? What Can You Feed Pregnant Cows?